Maggie Rogers in her Sperryville printmaking studio. Because of my unplanned return last spring to the Rappahannock News, my planned series of short videos on the artists of Rappahannock took nearly a year to get rolling. But thanks initially to the generous 2016 grant by the Rappahannock Association for Arts and Community’s Claudia Mitchell Arts Fund, and then to the Mitchell Fund committee’s patience and understanding in allowing me to get the promised first six videos done by the end of September 2017, we are now launched! 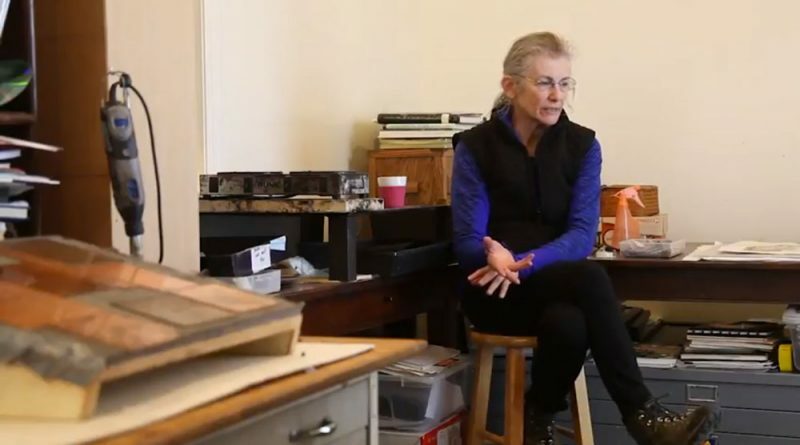 This first video is a brief visit with Maggie Rogers in Sperryville, Va. — where Maggie’s printmaking studio shares the building with her family’s coffee roastery, and from which Maggie also pursues her love of hiking, nature and gardening. You can play the video below, or visit the Synergist Media YouTube channel and subscribe — especially as we add videos. The next one coming up in early August is on plein air painter Nedra Smith of Washington, Va.
Synergist Media, and especially these videos, would not be possible without the hands-on assistance of photographer and videographer extraordinaire Luke Christopher, and the full-hearted advice and support of Luke’s mom, Charmaine Lee, my wife, ally and inspiration. 10 Comments on Artists of Rappahannock video series: Launched! Thanks, Kevin. Six videos is what the grant covered, by September. But I am just going to keep going, at least through the end of the year, and see what happens. Very grateful for the opportunity, and by the way if you’re up for it I planned to knock on your door at some point, camera in hand. Beautiful Roger. Very happy to see your work. Exciting! Lisa Lisa Lisa, so am I. What a great series you’ve begun, Roger! Look forward to more. Beautiful blend of storytelling, music, film, art – thank you (and Charmaine, your muse) for this artistry. Thank you, Charise. I’m actually having a lot of fun. Please don’t tell anyone. Beautiful Roger. So glad you’ve got this underway. And I love the music…it was noticeable, along with the other cool stuff. Congratulations! What a worthwhile project and a wonderful way to support the artists in your community.